"A sweet-tart combo that is fabulous on a hot day!" Place the rhubarb into a saucepan, and pour in the water. Cover, and bring to a simmer over medium heat. Reduce heat to medium-low, and continue simmering until the rhubarb breaks down and releases its juices, about 15 minutes. Strain the juice, and press the pulp to squeeze out as much liquid as you can. Discard the pulp, and stir the sugar into the hot juice. Refrigerate the syrup until very cold, at least 2 hours. 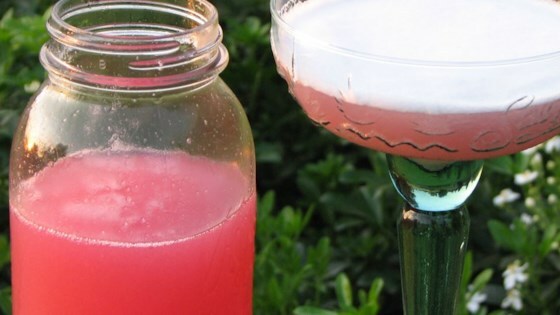 To prepare the margaritas, place the ice into a blender, then pour in the tequila and rhubarb syrup. Blend until smooth, or until pureed to your desired consistency. Pour into chilled margarita glasses to serve. Delicious!!!! I used honey instead of white sugar. Next time I'll cut back a little to give it a bit of a pucker. Thanks!!! I puréed the rhubarb mixture instead of straining. Added the tequila and a bottle of diet lemon lime soda. It was an excellent punch. Everyone raved and could not believe it was rhubarb.